Hola, how is everyone doing with the World Cup Fever? Now the tension is on to discover which teams will make it to the semifinals. But we need to wait until Friday. Do you know how a poor boy from Brazil who loved fútbol more than anything else became the biggest soccer star the world has ever known? Turn the pages of this book to read the true life story of Pelé, King of Soccer, the first man in the history of the sport to score a thousand goals and become a living legend. Rudy Gutiérrez's dynamic illustrations make award-winning author Monica Brown's story of this remarkable sports hero truly come alive! ¿Sabes cómo un niño brasileño pobre que amaba el fútbol más que nada en el mundo se convirtió en la estrella más importante del deporte? Lee este relato y entérate de la historia de Pelé, El rey del fútbol; el primer hombre en la historia del deporte capaz de marcar mil goles y convertirse en una leyenda viva. Las dinámicas ilustraciones de Rudy Gutiérrez destacan vívidamente los momentos recreados por la escritora premiada Mónica Brown en este extraordinario libro. Last year La Bloga had the honor to interview Monica Brown. This is just the first question. To read the complete interview click here. 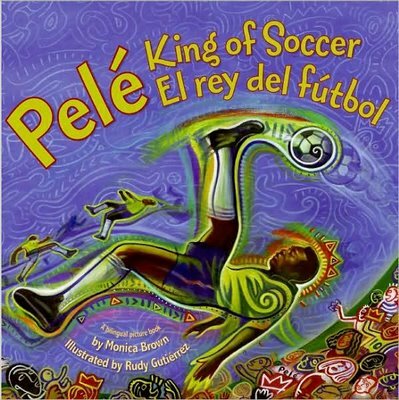 Congratulations on your new book Pele King of Soccer, Monica you are truly the queen of Latino children’s book biographies. How did you get the idea for this great book? How fun to be queen of something! More seriously, I am surrounded by people that inspire me, from the children I meet to the folks in publishing who fight to get these stories told. As a Peruvian-American, I grew up with an appreciation for Pelé's physical genius and an understanding of what he represented for the children of South America. The idea to write about him grew out of conversations with my husband (who has coached each of our girl's soccer teams) and my agents, Stefanie Von Borstel and Lilly Ghahremani. I've was also inspired by my brother Danny, who has played soccer semi-professionally and who now plays for the CAL Men's Club team. Since I have a soccer-crazy family, this was a natural project for me. In celebration of the 2010 World Cup, author Monica Brown created this book trailer about Pelé, the legend at the heart of Brazilian Soccer. She's also donated a signed copy of the book to the readers of La Bloga. Leave a comment about your favorite fútbol's team and why you would like this book. La Bloga will choose and announce the name of the lucky reader next Wednesday. Posted by Rene Colato Lainez at 1:45 AM 4 comments. Click here to leave a comment. Guest Writer: Interview with the Poet: Francisco X. Alarcón. 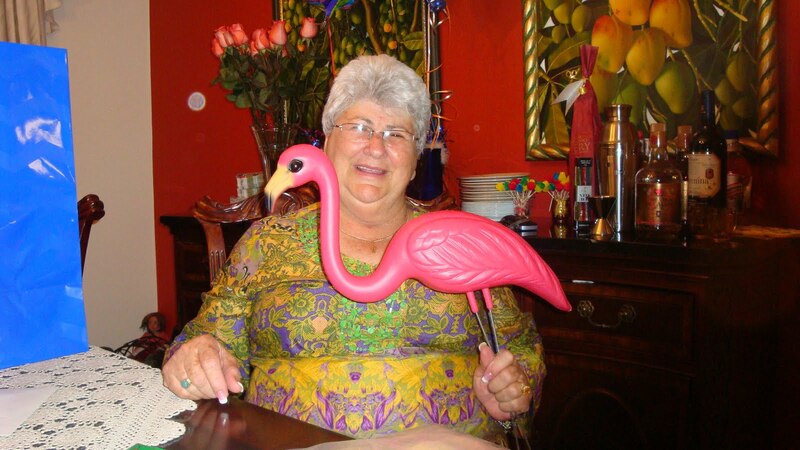 On-Line Floricanto. TDP: Tell us about your greatest satisfactions as a poet? FXA: There are several things that have given me great satisfaction and a sense of accomplishment during my trajectory as a poet. One of the greatest satisfactions is to have been able to contribute for the opening of new publication possibilities for Latino writers who live in the U.S. through an independent publishing house, Children’s Book Press of San Francisco, California. I served first as a translator (Spanish to English; and English to Spanish), consultant, and then, as an editor of several children’s books done by Chicano/Latino writers and artists who for the first time were publishing bilingual picture books for children. I also served as a Board Member of the Board of Directors of the non-profit Children’s Book Press. For myself, it took me several years to be able to publish my first book of bilingual poems for children, “Laughing Tomatoes and Other Spring Poems / Jitomates risueños y otros poemas de primavera” (Children’s Book Press 1997) because the main editor thought that a children’s book with bilingual poems will not sell well in the U.S. But this first picture children’s book with bilingual poems was very well received by readers in general and by critics in special. It was awarded several prestigious literary awards, and it was the first of title of a series of four picture books dedicated to the seasons of the year published by Children’s Book Press. The four books include wonderful artwork by San Franciscp-based Chicana artist Maya Chistina Gonzalez: “From the Bellybutton of the Moon and Other Summer Poems / Del ombligo de la luna y otros poemas de verano” (1998), “Angels Ride Bikes and Other Fall Poems / Los ángeles andan en bicicleta y otros poemas de otoño” (1999), and “Iguanas in the Snow and Other Winter Poems / Iguanas en la nieve y otros poemas de invierno” (2001). These picture books were also awarded several important literary prizes. The fact that around 250,000 copies of these books have been sold means that there is a big market for bilingual poetry books for children in the U.S.
TDP: Do you write another genre besides poetry? FXA: I have also written short stories. One these short stories, titled “Las repatriaciones de noviembre” (“The Repatriations of November”), deals with a Latino family in Los Angeles, California, that is about to move to Mexico during the Big Depression in 1931 when being “Mexican” had become almost a crime. 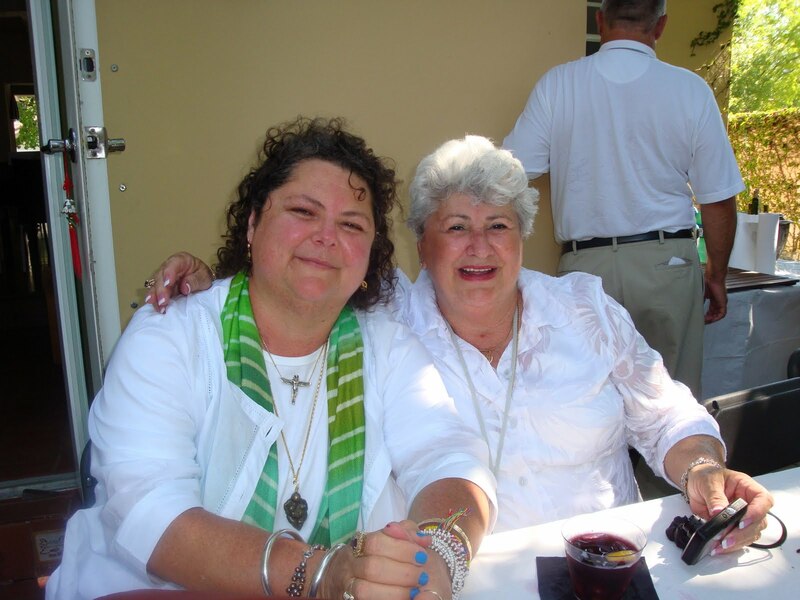 It’s a story based on real life experiences endured by my mother’s family. It was awarded a major literary prize in Texas, and it has been included in several Chicano Literature anthologies published in the U.S. and Spain, and in many Spanish language textbooks as well since it was originally written in Spanish. At the moment I am interested in exploring different poetic forms, styles and themes, like eco-poetics. Recently I was named Editor of POETAS•PUENTES, a new poetry series of Swan Scythe Press of Sacramento that will concentrate on publishing original poetry written in Spanish and Mesoamerican indigenous languages with English translations. “Ce / Uno/ One: Poems for the New Sun / Poemas para el Nuevo Sol” –my new book of poems in Spanish, English, Nahuatl, some Gaelic and Mapuche- will inaugurate this new poetry series. TDP: Children are natural poets, why then, children poetry workshops? FXA: I really love to visit schools, do poetry presentations, and facilitate poetry workshops for school children. After visiting and doing hundred of classroom poetry presentations and workshops, I have learned that children from the third grade to the sixth grade are truly excellent natural poets. I have come out with Poetry Lesson Plans intended to show children how poetry really works, about the use of comparisons, similes, metaphors, and the five senses, in addition to the sixth sense that in poetry is our own imagination. I have a poetry lesson titled “Our Dreams” in which the students write a poem visualizing themselves in the future. Students first interview older family members about the dreams these relatives had when they were children. Then the students are asked to visualize themselves in the future and write a poem about their future lives using their five senses and their imagination. As a response to amazing poems written by students of a bilingual school in Washington, DC, Oyster Bilingual Elementary School, I wrote a collection of bilingual poems illustrated by Paula Barragán, “Poems to Dream Together / Poemas para soñar juntos” (Lee & Low Books 2005). I would love to be able to participate in the First Festival of Children’s Poetry in El Salvador in order to share my own experiences and to also learn from other participants. TDP: In your life as a teacher and as a poet who had conducted hundreds of poetry workshops, do you know of any children, any youth who had been member of gang and once they enter in contact with poetry their life had a positive changed? FXA: Some years ago I had a very special experience at Oyster Bilingual Elementary School in Washington, DC., in which a third of the students are Latinos, a third are Anglo students, and the other third are African-Americans. The majority of the Latino students are of Salvadorian origin because there is a big Salvadorian community in the federal capital of the U.S. The poems was an ode in honor of the hard working father who had immigrated to the U.S. from El Salvador in order to give a better life to his children and family. When José read aloud his poem in front of the class, the teacher and librarian couldn’t contain their tears since they knew the very difficult circumstances that José’s family had undergone. The poem also impacted José’s classmates who applauded very effusively at the end of his reading of the poem. Some days later the teacher sent me an e-mail to let me know that José’s dad was so moved by the poem that he had bought a computer so that José could continue writing poems. Weeks later, the same teacher notified me that José had sent the poem dedicated to his dad to a children’s poetry contest organized by the Library of Congress in Washington, DC, and that he had won a prize and had been awarded a full scholarship to attend a prestigious private academy where he was going to go for his high school with all expenses paid. This is just a concrete example of a real impact of poetry on the life on a Salvadorian boy who lives in the capital of the U.S.
TDP: You are a very dynamic poet, what are you doing right now with poetry? FXA: This Summer I’m finishing a collection of poems in three languages (in Nahuatl, Spanish and English) "Tonalámatl: el libro de los días / the Book of Days" that deals with the Mesoamerican calendar. This would be the first time that a collection of poems in these three languages would be published in the U.S. I don’t a have a publishing house yet, but I hope that I will find a press willing to publish this unique book of poems for young readers by the end of Summer. On Abril 24, 2010, as a direct result of the discriminatory law against undocumented immigrants known as SB 1070 that was approved by the legislature in Arizona and signed into law by the governor of that state, I created a new Facebook page, POETS RESPONDING TO SB 1070, that at the moment has 3,500 fan members and has posted and indexed around 430 poems by poet from different regions of the U.S., Mexico, Spain, Iran, and other countries of the world. TDP: For many years you had been a friend of El Salvador, tell us how was this poetic relation? FXA: I have felt a natural cultural affinity with El Salvador for many years that really goes beyond just poetry. My paternal grandmother was an indigenous person from the Nahuatl tradition in Mexico and I had a very close relationship with her that marked forever my whole life. The indigenous peoples known as Pipiles in El Savadot are part of this same big Mesoamerican cultural tree. I love the colloquial language known as “guanaco” that is used in El Salvador, with words like “cipotes” (“children”), “metate” (“grinding stone”), and “Cuzcatlán” that are words with Nahuatl origin; the legends of the Siguanaba and the Cipitío are now mine; one of my favorite foods are “pupusas” (“corn cakes”) that are filled either with cheese, “chicharrones” (“pork meat”), and “loroco” (a tropical flower). Of course, all this knowledge of Salvadorian culture have resulted from my close contacts, friendships, and socialization with people from El Salvador who live in the U.S.
As many other Chicanos/Latinos, I couldn’t remain indifferent or unconcerned in front of the heroic resistance of the poeple of El Salvador during the social conflict and civil war the 1980’s that only ended with the Peace Agreement of 1992. 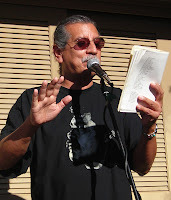 I was an active member of the Roque Dalton Cultural Brigade in San Francisco headed by Chicano poet Alejandro Murguía, and with thr participation of poets like Jack Hirschman, Juan Felipe Herrera, Barbara Paschke, David Volpendesta and activists like Magaly Fernández, Tony Ryan,and Rosa María Galdámez, among others. This cultural brigade published the first bilingual anthology of Central American poetry in the U.S. and several bilingual book of poems by masters of politically committed poetry, the Salvadorian poet Roque Dalton and the Guatemalan poet Otto René Castillo. I was also member of CÓDICES, a Salvadorian cultural center directed by professor/poet/artist Martivón Galindo in the Latino barrio of the Mission in San Francisco where Salvadorian culture is without doubt an integral part of its rich cultural rainbow. Poet Jorge Argueta, artist/muralist Isaías Matta, and narrator/poet Manlio Argueta are some of the Salvadorian who have bestowed a cultural and literary legacy to our community and whose works I treasure, study and teach at the university level as part of my teaching duties at the University of Cailfornia, Davis. I wish that in a near future I will able to visit in person the old “Cuzcatlán” of my dreams-El Salvador. His most recent book of bilingual poetry for children, "Animal Poems of the Iguazú" (Children’s Book Press 2008), was selected as a Notable Book for a Global Society by the International Reading Association, and as an Américas Awards Commended Title by the Consortium of Latin American Studies Programs. His previous bilingual book titled Poems to Dream Together (Lee & Low Books 2005) was awarded the 2006 Jane Addams Honor Book Award. Children’s Book Press of San Francisco published his acclaimed “Magic Cycle of the Seasons” that includes four titles: " Laughing Tomatoes and Other Spring Poems" (1997) awarded the 1997 Pura Belpré Honor Award by the American Library Association and the National Parenting Publications Gold Medal; "From the Bellybutton of the Moon and Other Summer Poems" (1998) that received the 2000 Pura Belpré Honor Award; "Angels Ride Bikes and Other Fall Poems" (1999); his fourth book of bilingual poems for children, "Iguanas in the Snow and Other Winter Poems" (2001) received the 2002 Pura Belpré Honor Award. 1. 3 Poems by Joe Navarro: "Protest Racism Every Day," "See You Later, Arizona," and "Liberate Arizona"
3 Poems by Joe Navarro: "Protest Racism Every Day," "See You Later, Arizona," and "Liberate Arizona"
behind latino bars today -- no sir! “They’re slowing them all down. Mi comadre breaks the silence. if we wanted to stay. So I do not become an endangered species. I will share my legality. I no longer ask "when?" of having to go on. in my locks from swimming at night. a summer I’m proud I survived. that stir from the grip of my fist. Is it wrong to follow the ghosts? say no, denying my entrance again. There are miles of handkerchiefs to iron. There’s a city of hearts to sweep up. There are lines that need to be written. There’s another black dress waiting to be worn. bad luck creeps over us both. can avoid or heal scalds and cuts. can call out the warning. Joe Navarro is a creative writer, poet, teacher and community activist. He is originally from San Francisco, CA, previously lived in Oakland, CA and Denver, CO, but currently lives in Hollister, CA. His poetry is shaped by people’s struggles for self-determination, justice and equality. George Wallace is Editor of Poetrybay.com, author of nineteen chapbooks of poetry, and the first poet laureate for Suffolk County, LI NY. He teaches at Pace University in Manhattan, and has been selected as writer in residence for the Walt Whitman Birthplace for 2011. Israel is a graduate of U.C. Berkeley with a degree in English and Xicano Studies and an M.F.A. from California College of the Arts. He is both a visual artist and performance artist. 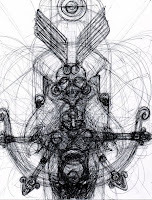 His work is an attempt to search for personal truths and personal histories inside of american cosmology. 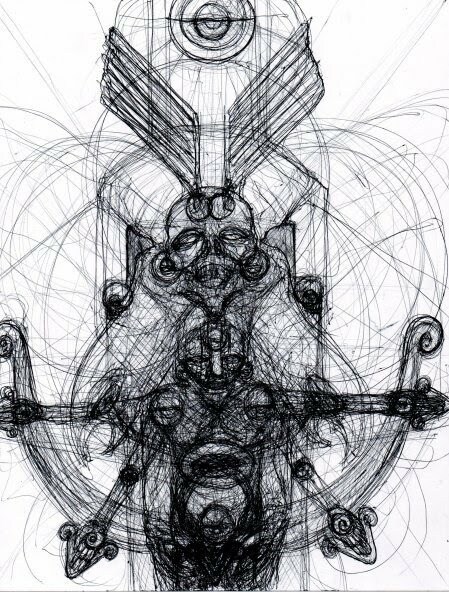 The american cosmology and symbolism that he is drawing from is one that involves both northern and southern america that was here before columbus. The work both written and that which is painted is attempting to mark and remark historical points in the americas and the world.The mark making attempts to speak to the undeniable presence of a native america that will continue to flourish for generations to come.The understanding which he is drawing from is not conceptual but fact and points to the importance of honoring and remembering ancestral ways of living as a means of maintaining healthy relations with all humans,the winged, all those that crawl on this Earth, all Life, the Water, the Sacred Fire, Tonanztin, Tonatiuh,the Sacred Cardinal Points,everything inbetween, above and below and at the center of self and all things in the universe. Jeanette Iskat de Aldana is a painter, found object artist and poet living and working in Los Angeles. She grew up around the world and is interested in our collective history and humanity. You can find her online at Facebook or hanging out in Boyle Heights at Corazon del Pueblo. She's working on her first book of poetry and is a newlywed. Stephanie Little Wolf is a singer, songwriter, poet and research technician. She attended Cabrillo Junior College, she attended the University of California, Santa Cruz, where she was a member of the Creative Writing Program. She graduated with honors with a BA in Writing and Literature in 1996. 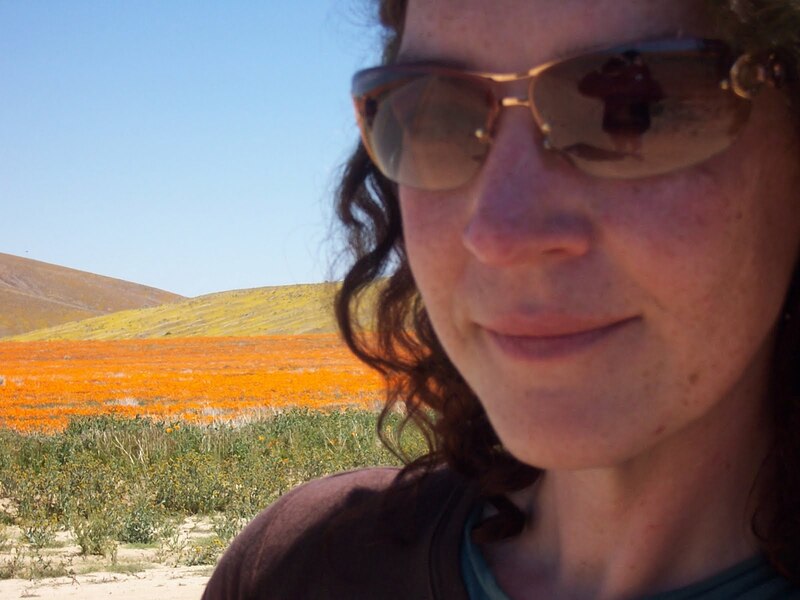 Her studies and interests include DNA research, Anthropology, Archeology, and Sociology, pre-Columbian life in North America and the development and domestication of the dog in prehistory. Of Lakota and Yaqui decent, Stephanie has lived and worked in Alaska for many years, preserving her family's bloodline of sled dogs which she inherited in 1989. She has worked with Native Alaskan foster children and her sled dogs, developing a healing environment for abused and neglected children as they learn to care for and run sled dogs. 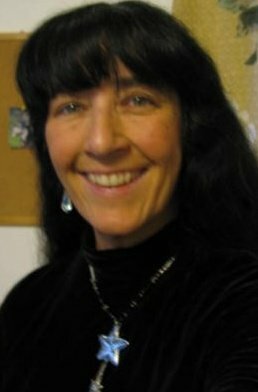 In addition to her work with children and dogs, Stephanie has worked with Native non-profit organizations in Alaska to preserve Athabascan culture and language, and has followed this up with a pocket dictionary project at the Alaskan Native Language Center, at the University of Alaska, Fairbanks, where she worked to preserve the Lower Tanana Dialect of the Athabascan language family. 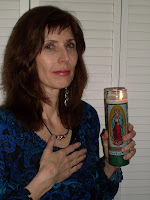 Carmen Calatayud is a psychotherapist in Washington, DC. Born to a Spanish father and Irish mother, her poetry has appeared in journals such as Borderlands: Texas Poetry Review, Cutthroat: A Journal of the Arts, Slow Trains, Red River Review and PALABRA: A Magazine of Chicano and Latino Literary Art. Her poems are anthologized in various collections, including DC Poets Against the War: An Anthology (Argonne House Press) and Mondo Barbie (St. Martin’s Press). Her poetry manuscript Cave Walk was a runner-up for the 2010 Walt Whitman Award and a finalist for the 2010 Andrés Montoya Poetry Prize. 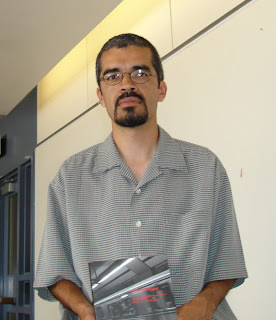 Calatayud won a 2003 Larry Neal Award for Poetry. 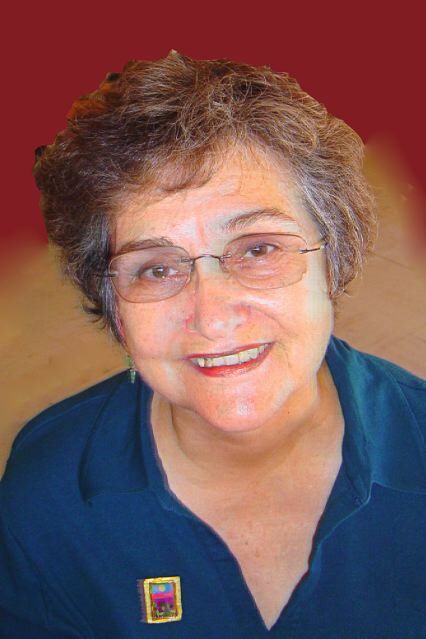 She lived and wrote in Tucson in the 1990s, where she worked as a literacy advocate. 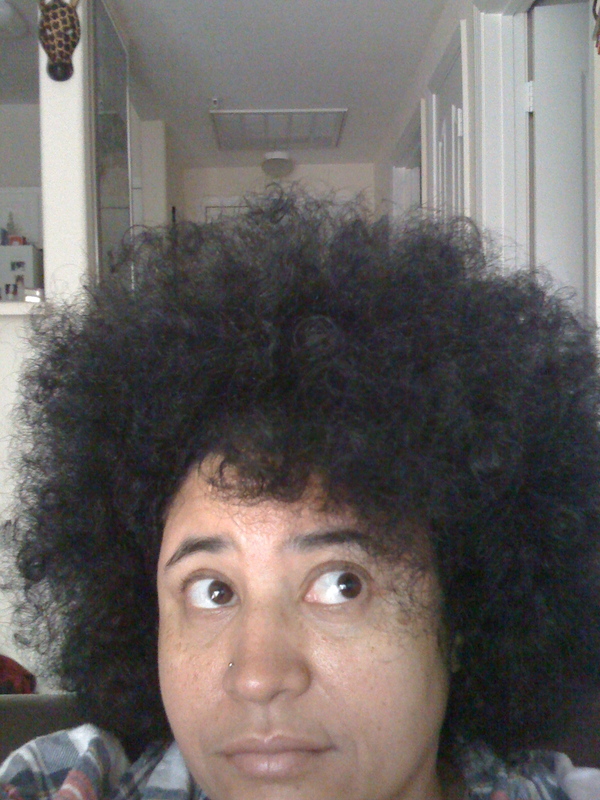 JoAnn Anglin lives in Sacramento and is active with Los Escritores del Nuevo Sol/ Writers of the New Sun, and belongs to the Sacramento Poetry Center. She has worked as a poet in the schools and has written articles on poetry and on the arts in general. Her poems have been published in Poetry Now, Rattlesnake Review, The Pagan Muse, and several other anthologies. She has co-hosted poetry series in Sacramento and been a featured poet at varied Northern California poetry readings. JoAnn’s chapbook of poems, Words Like Knives, Like Feathers, was published by Rattlesnake Press. Posted by msedano at 12:01 AM 1 comments. Click here to leave a comment. Not to be outdone by the late segregationist, Alabama Gov. George Wallace, Arizona Gov. 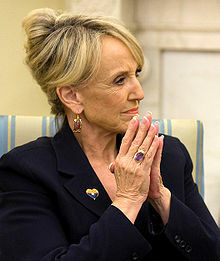 Jan Brewer (pictured above) will go down in the history books as an ardent xenophobe and racist. Brewer’s hatred of immigrants and disregard for the civil rights of Latinos (both legal residents and citizens) have come to fruition in Arizona’s recently passed laws aimed at criminalizing immigrants, racially profiling Latinos and denying racial minorities the right to learn about their history. I’m speaking, of course, of SB 1070, the unconstitutional law that requires police officers to demand legal documentation of individuals suspected of being undocumented immigrants under the premise of “reasonable suspicion” and HB 2281, the racist law that bans ethnic studies (optional courses, as a matter of fact) in public schools. Instead of chastising Brewer for her racist legislative actions, President Barack Obama recently invited her to the White House to discuss the controversial immigration law that the president referred to as “misguided.” This is the same president that had a “Beer Summit” at the White House with a racist police officer, Sgt. James Crowley, shortly after he arrested Harvard Professor Henry Louis Gates, Jr.—a distinguished African American scholar—in his own home. This high profile arrest can be traced to Gates’ initial “inability” to verify proof of residence to Crowley even after Gates provided his Harvard faculty identification card. As any parent should know, this is no way of rewarding bad behavior! Better yet, instead of meeting with Brewer in a one-to-one meeting usually afforded to world leaders, Obama should chastise the rogue governor and take direct action against Arizona’s racist agenda. Obama can learn a thing or two from previous presidents. For instance, in 1963, then-President John F. Kennedy federalized the Alabama National Guard when Gov. Wallace attempted to prevent two African American students from attending the University of Alabama under a federal court order to desegregate public schools. An ardent segregationist, Wallace, who operated under the political platform "segregation now, segregation tomorrow, segregation forever," eventually caved under pressure when confronted by the military might of the federal government. Taking this historical event as a “teachable moment,” Obama needs to use all of executive powers, including unmatchable oratory skills, to immediately repeal both SB 1070 and HB 2281. While Obama and U.S. Attorney General Eric Holder contemplate legal action, individuals of Mexican decent in this desert state live in a constant state of fear, anxiety and financial insecurity. When she originally signed SB 1070 into law on April 23rd, Brewer assured the public that racial profiling would not be tolerated. However, what does she—a white, privileged politician—know about racial profiling? I wonder if she, or any member of her family, has even been a victim of racial profiling? More specifically, has she ever been denied a taxicab in the city of New York or other major city because of the color of her skin? Has she ever been pulled over by a police officer for simply being in the “wrong neighborhood” or because she allegedly “matched the description” of someone suspected of committing a crime? While Brewer and the supporters of this anti-immigrant law attempt to frame this policy measure as one of “crime” and “safety,” especially with the law’s official name, “Support Our Law Enforcement and Safe Neighborhoods Act,” they have yet to produce any hard data correlating immigration with crime in the state. There is a word in the dictionary for making false accusations: slander. While much of the attention in the media has been given to this cruel immigration law, Brewer wasted no time in attacking the Latino community, once again, with the elimination of ethnic studies programs in public schools. In an Orwellian maneuver, Brewer, the architect of this ban—Arizona’s school chief Tom Horne—and other supporters argue that ethnic studies programs allegedly promote ethnic chauvinism, reverse racism against whites and the overthrow of the U.S. government. It is amazing how educational programs aimed at providing a more ethnically diverse interpretation of American life and history have now become eminent enemies of the state. For instance, how is teaching a Latino high school student about the United Farm Workers (UFW) and the fact that Cesar Chavez was born in Yuma, Arizona, suddenly un-American? How is teaching a young Latina student about Dolores Huerta, the co-founder of the UFW, now a criminal act? Does this mean that Latino and Asian students can’t learn about the unconscionable Japanese American internment camps, where the state of Arizona hosted one, during the mid-20th Century since this falls under the purview of “ethnic studies” programs? The only logical conclusion here is an obvious attempt by those in power to erase the history of discrimination and social injustice committed against racial minorities in the state and beyond. Finally, if we critically examine the motives behind these anti-Latino laws, it’s clear that many people in Arizona and beyond fear and loathe the long-term consequence of Mexican immigration in particular and the demographic boom of Latinos in general, resulting in the browning of America. Posted by Daniel A. Olivas at 12:01 AM 1 comments. Click here to leave a comment. This was originally published in Spanish as “El regalo” in 1992 in the latina lesbian magazine esto no tiene nombre. 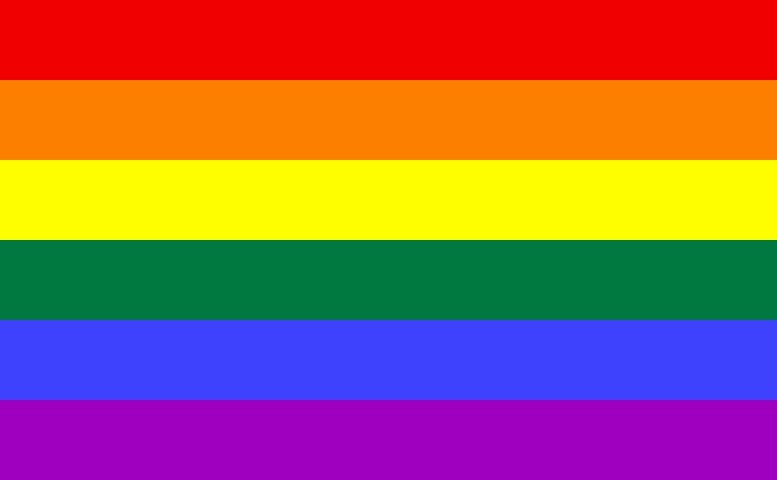 We share it in la Bloga to celebrate gays, lesbians and transgender people throughout the world, with respect and love for all. 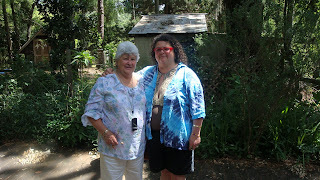 Mother’s Day passed and left me thinking about the mothers and daughters who didn’t celebrate it. I think of the mother who let intolerance close her heart in pain and of the daughter who suffers from the rejection. I know the wall this mother builds is made of silence and fear and answers that are not accepted or searched for from within. I know this wall will separate her from her daughter to the end. When my daughter’s umbilical cord was cut I was fortunate to understand that it was merely a physical separation and that what would unite us later, stronger than a band of fleshy fibers, would be love, mutual respect, understanding, and acceptance. 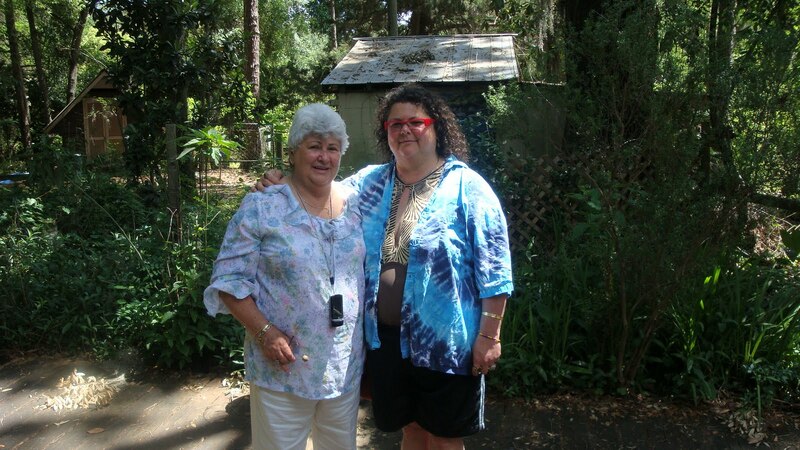 When I found out that my daughter was a lesbian I felt confusion and pain. I knew this was more than a word or a way of life. I knew how hard society is against this group of people. I knew they were discriminated against and even persecuted at times. I knew this because these attitudes are the ones that I had felt toward homosexuals all my life. My first step was acceptance. I didn’t think of trying to change her or offering to take her to a psychologist. I know my daughter well. When she chooses a path it is because she is convinced that it possesses her truth. Little by little, without much desire but with great curiosity, I began to learn, to try to understand what it means to be a homosexual. I’ve only known my daughter’s lesbian world. She is a feminist who embraces woman-related issues, including history, submission, and subjugation. She even fights for women’s rights, including the right to abort, which I don’t agree with. She was one of the editors of the latina lesbian magazines esto no tiene nombre and conmoción (published in Miami, 1990-1996). Her articles were controversial. She is atrevida, daring in the choice of her material. I don’t like some of the things she writes about, like sadomasochism. But I admire her style of writing. And I like her way of delving into irreverent themes, as she does in the poem “The Day I Learned to Pray” and her poem about women with beards. She even lets her own facial hair grow without shaving or bleaching it, which is something that people, including me, don’t like to see or read about. In other words, we have differences between us, some of them deep. I am Christian, and she is pagan. She doesn’t accept God or Jesus. For me, Christianity is more than a belief. I live my religion. For me, a mother’s love is like God’s love, unconditional above all. I am proud of her and everything she has accomplished in her life, of what she is as a woman and as a person. She had the courage to step forward when many, out of fear, have stayed in the closet, and through esto no tiene nombre and conmoción she supported her community. My daughter was born on an early Sunday on Mother’s Day and God knows why she was given to me on such a special day. Since then I’ve been given fine, luxurious gifts, but none of them have ever equaled her. Este comentario fue publicado originalmente en 1992 en esto no tiene nombre, revista de lesbianas latinas. Lo compartimos en la Bloga para celebrar las vidas de los gays, las lesbianas y l@s transgénero que andan en todo el mundo, con respeto y amor para tod@s.
El día de las madres ya pasó, pero me quedé pensando en las madres y las hijas que no lo celebraron: en la madre a quien la intolerancia selló su corazón con dolor y en la hija que sufre por el rechazo, la falta de comprensión. Y yo sé bien que mientras esa madre busca dentro de sí misma la respuesta, o no quiere aceptar la verdad, y se consume en silencio, por temor o tal vez por el qué dirán, va construyendo una muralla que la separa de su hija al final. Yo tuve la suerte de comprender que cuando le cortaron a mi hija el cordón umbilical nos habían separado físicamente, y que lo que nos uniría después, más fuerte que un pedazo de tripa, sería el amor, el respeto mutuo, la comprensión, la aceptación. Cuando me enteré que mi hija era lesbiana, sentí confusión y dolor; pero sabía que esto era más que una palabra o un sistema de vida. Conocía la dureza de la sociedad ante este grupo de personas, la discriminación y hasta la persecución en algunos casos. Esto es algo que había yo misma pensado y sentido hacia los homosexuals toda mi vida. Mi primer paso fue aceptar. No pensé en tratar de cambiarla no ofrecerle llevarla al sicólogo, etc. Al fin de cuentas, bien la conozco y sé que cuando ella ha decidido un camino o encontrado una causa es porque está convencida y es para ella poseedora de la verdad. Poco a poco, sin muchas ganas, pero con mucha curiosidad, empecé a aprender, a tratar de entender lo que hay detrás, lo que significa ser homosexual. En mi caso he visto sólo el grupo de lesbianas y quizás lo que sé de ellas es el ambiente donde mi hija se desenvuelve; ella es feminista porque abarca toda la problemática de la mujer, desde la historia, la sumisión, la subyugación, hasta la lucha por los derechos, incluso algunos en los que profundamente diferimos como es el aborto. Ella fue parte de la editorial de esto no tiene nombre, revista de lesbianas Latinas (1990-1995) y sus temas fueron controvertidos. Para mi es bien atrevida al exponerlos, y algunos como el sadomasoquismo, no es que me gusten. Pero lo que sí admiro es su estilo de escribir, la forma de meterse en temas irreverentes como el poema “El día que aprendí a rezar,” el poema de las mujeres con barbas, y aún más, atreverse a dejar sus pelos en la cara sin afeitar o teñir, cosa que la gente (incluyéndome a mí) no le gust aver ni leer al respecto. En otras palabras, entre nosotras hay diferencias, algunas muy profundas. Yo soy cristiana y ella es pagana. No acepta o reconoce a Dios y mucho menos a Jesús. Para mí el cristianismo no es sólo una creencia sino una vivencia; yo vivo mi religión. Sin embargo, para mí el amor de madre es como el amor de Dios, incondicional, y eso prevalece sobre todo. Yo estoy orgullosa de ella y todo lo que ha logrado en su vida, de lo que es como mujer y como persona. Ella tuvo el valor de dar el paso adelante cuando muchas, por el temor, se han quedado en el “closet” y por medio de la revista esto no tiene nombre le dió apoyo e incentivo a la comunidad. Mi hija nació tempranito un domingo día de la madre y Dios sabía por qué me la dio en un día tan especial. Desde entonces me han obsequiado regales finos, lindos y lujosos, pero no ha habido ninguno que la pueda igualar. Posted by tatiana de la tierra at 1:16 AM 4 comments. Click here to leave a comment. Please read Tina Griego's column in The Denver Post concerning the upcoming performance of Luis Valdez's wonderful acto. Opening Night! : Special “Taste de las Americas” tickets include dinner & ticket to Zoot Suit and can be purchased here. For tickets for the show only call 866-464-2626 or click here. Tina Griego's article says it all, so I won't repeat it since you can go to her link to read all about it. Having had the pleasure of seeing the first performance of Zoot Suit six years ago, I highly recommend this event. Opening night tickets are hefty since they include Tastes of Colorado, but tickets for the other nights are $10 for students and the 70+. Posted by Contributing Bloguistas: at 8:57 AM 0 comments. Click here to leave a comment. Today I have a guest contribution from the inimitable Flo Hernandez-Ramos, Project Director for the Latino Public Radio Consortium. Flo got a little upset because of a snub to the Latino aspects of and contributions to Denver, but instead of stewing in her juices she came up with a nifty response - her own Guide to Latino Denver. This Guide is hot off the press and just this week was made available to the visiting National Association of Hispanic Journalists, who are in town for their annual conference. The pamphlet is laid out in an attractive format that doesn't get justice on our blog and I am using only a few of the photos and images, but the information is all here. It just might encourage you to wander around the Mile High City this summer. The Guide adds considerably to a column I did for La Bloga a while back, Five Reasons It's Great to be a Chicano in Denver. Hope you enjoy the guided tour of the city I call home - and you know how home is: messy, sometimes too familiar, but always comfortable. There are no Latinos in Denver. At least according to the in-flight magazine of a Denver-based airline whose name will not be mentioned but those cute animals should know better. The article was titled “The True Denver” and purported to list the attractions that would give the tourist an “authentic” experience. I read and re-read the article, but alas, there was no mention of the numerous Latinos, African-Americans, Native Americans or Asians that make Denver a truly great city. But why was I surprised? Over the years I have had the good fortune of visiting various cities and not once in the guides strategically placed in hotel rooms and lobbies has there been much more than a cursory mention of that city’s people of color. Thus was born this Guide to Latino Denver. As a courtesy to visitors to the Queen City, the Latino Public Radio Consortium will give you some idea of the influence Latinos have on Denver and how you can rub elbows with the locals. Latinos must be doing something right in a city where we constitute 31% of over ½ a million people and which has streets (Peña Boulevard, the main thoroughfare connecting DIA to I-70), parks (Martínez Park, 10th & Raleigh), schools (Lena Archuleta Elementary, 16000 Maxwell Place) and buildings (Richard Castro Social Services, 12th & Federal) named after Latinos. But remember, this is only the perspective of a Mexican-American; other Latinos from Denver can add much more. When you meet them, ask them for recommendations too. Enjoy. Denver is one of 33 cities in the United States that can boast to having a Latino-controlled public radio station on its radio dial. KUVO/KVJZ jazz89 (89.3 fm www.kuvo.org). Yes, you read right – JAZZ. The station, like the majority of the Latinos in the area in 1985 when KUVO began broadcasting, broadcasts primarily in English and offers a music mix of jazz, Latin jazz and blues. But Latin Soul Party (Friday, 8pm-10pm) kicks off KUVO’s visit to its musical roots on the weekends. Sunday is known as Latino day because it is dominated by La Nueva Voz (8 am – 9 am), Canción Mexicana (10 am – 1 pm), La Raza Rocks (1 pm – 2 pm), Salsa con Jazz (4pm – 6 pm) and if you consider Brazil part of the Latino constellation, the station also has Brazilian Fantasy (6 pm – 8 pm). Community radio KGNU (88.5 fm/1340 am) also serves Latinos with Qué Onda, Latino USA, and La Lucha Sigue. And of course, because the Latino population has grown so much, cruising through the dial, you’ll find numerous Spanish-language, commercial radio stations with music from Mexico. Listening to all this music make you feel like dancing? Decide which genre is part of your groove. If it’s New Mexico and Tejano music that makes you tirar chancla, go to Rick’s Tavern (6762 Lowell Boulevard; 303-427-3427; www.rickgarciaband.com) on Saturdays and Sundays; salsa is on Thursday nights at La Rumba (99 W. 9th Avenue; 303-572-8006; www.larumba-denver.com); norteño and banda is at Tequila Le Club (5011 Federal; 303-480-0302). I’m sure there’s more, but I don’t get out much. A vibrant Latino cultural scene has found a home a few short blocks from downtown Denver in the Santa Fe Arts District, a unique, nationally known art and cultural district with over 60 galleries, restaurants and shops. In the District you’ll find Su Teatro at the Denver Civic Theater (721 Santa Fe Drive; 303-296-0219; www.suteatro.org) whose new building gives its local presentations of plays, film, poetry and music festivals and visiting artists (recently Benjamin Bratt) a more comfortable and centrally located venue. A block north of Su Teatro are the galleries of CHAC the Chicano Humanities & Arts Council (772 Santa Fe Drive, 303-571-0440, wwwchacweb.org), one of the city’s oldest art co-ops, exhibiting the work of their members which run the gamut of emerging to internationally recognized artists. CHAC has one of the biggest Tienditas (that’s probably an oxymoron) with an extensive inventory of one-of-a-kind, affordable art and jewelry to mass-produced Lotería plates, Frida Kahlo ephemera and absolutely delightful Dia de los Muertos chachkis. There’s also Museo de las Américas (861 Santa Fe Drive; 303-571-4401) whose exhibitions include local and international artists from thoughout Latin America and which also hosts films, Spanish happy hours and children’s activities. Denver’s robust literary scene includes novelists, poets, and storytellers such as Manuel Ramos (King of the Chicanos & Ballad of Rocky Ruiz, first of the Luis Montez mystery series; www.manuelramos.com), Mario Acevedo (Nymphos of Rocky Flats, first of the Felix Gomez vampire detective series; www.marioacevedo.com), Emma Pérez (Forgetting the Alamo or Blood Memory), Angel Vigil (Corn Mother; www.angelvigil.com); Ernesto Vigil (The Crusade for Justice: Chicano Militancy and the Government’s War on Dissent; www.books.google.com). Literary activists Lydia Gil, Rudy García, Manuel Ramos, and Jesse Tijerina contribute with book reviews, poetry, author interviews, and essays to La Bloga (labloga.blogspot.com) an award-winning national blog about Chicano literature y mas. In 2007 Lalo Delgado was posthumously named Denver’s poet laureate by Mayor John Hickenlooper. Best known for his poem “Stupid America” Lalo wrote in Spanish, English and a mixture of the two languages. A prolific writer, he would compose poetry for all occasions and was inspired by almost everything. Lalo’s recitations were delivered in his booming voice that needed no amplification. Café Cultura (www.facebook.com/pages/Cafe-Cultura/49001449645) is more a concept than a physical location. Great poets, open mics, spoken word and plenty of angst with a healthy scoop of anger and attitude happen the second Friday of each month at Denver Inner City Parish (1212 Mariposa Street; (303) 629-0636; www.dicp.org) which has hosted Denver’s celebration of Cesar Chavez’s birthday, houses La Academia, a private school. Traveling on Pena Boulevard from DIA you’ve probably already seen “Blue Mustang” a fiberglass sculpture with illuminated red eyes. It’s been dubbed “the killer horse” because its creator, Texas via New Mexico artist Luis Jiménez (wikipedia.org/wiki/Luis_Jiménez_(sculptor), was crushed to death while working on it. Local artist Emanuel Martínez (emanuelmartinez.com) has numerous pieces of public art throughout the state but you can see a prime example of his work just a stone’s throw from the Colorado Convention Center in the plaza of the Webb Building on the Colfax Street side. One of the most recent Latino-themed public art installations is at Morrison Road and Sheridan. Entitled “Un Corrido Para La Gente” the giant red guitar and papel picado sculpture is by Denver-born Carlos Frésquez (google him and you’ll find a ton of images). Denver was one of the centers of El Movimiento, the struggle for the civil and cultural rights of Chicanos. Established by Corky Gonzales in 1966, the Crusade for Justice existed in a building at 16th & Downing. The building was razed and a post office substation erected on the birthplace of the Chicano renaissance in arts, culture and politics. The community activism was paralleled and still exists on area college campuses through the United Mexican American Students UMAS and the Movimiento Estudiantil Chicano de Aztlan MECHA. In 1983, with the political slogan “Imagine a Great City,” Federico Peña defeated a 14-year incumbent to become the first Hispanic Mayor of Denver, an office to which he was re-elected in 1987. In his political career he has served as United States Secretary of Transportation and United States Secretary of Energy during the presidency of Bill Clinton and served on President Barack Obama’s transition team. Ken Salazar is a homeboy from Colorado’s San Luis Valley who served as Chief Legal Counsel for Governor Roy Romer, was elected Attorney General of Colorado and its State Senator. He is currently the United States Secretary of the Interior and part of the Cabinet for President Barack Obama. News about Denver’s Latino scene can also be garnered from newspapers and periodicals that concentrate on both the Engilsh-speaking and Spanish-language sectors of the Latino Community. La Voz de Colorado and El Semanario are bilingual papers while El Hispano is a Spanish-language publication. They’re distributed free at various venues around Denver. Anyone who says that Latinos don’t value education, probably didn’t have high SAT scores. Many of the area’s public, charter and alternative schools teach academics, social responsibility, cultural awareness and diversity. In its rosters Denver has Escuela Tlatelolco, César Chávez Academy, Academia Ana María Sandoval, Guadalupe Dual Language School, Arrupe Jesuit High School, La Academia at Denver Inner City Parish, Lena L. Archuleta Elementary and Richard T. Castro Elementary. Just like Latinos, restaurants with a Latino flavor are everywhere. Concentrating only on the venues in Denver, a few standouts come to mind. Cilantro Fusion (1531 Stout; 303-685-4986; www.cilantrofusion.com) serves the favorites of Mexico but with a twist. It’s not nouveau but it sure is good; Laguna’s (1543 Curtis; 303-623-5321) gives hefty servings of traditional Mexican food; want a side of grease with those tacos? Mexico City Café (2115 Larimer; 303-296-0563) and their fried tacos are legendary and delicious; at the chic end of Larimer Street, in Larimer Square, is Tamayo’s (1400 Larimer; 720-946-1433; www.richardsandoval.com/tamayo/); on the strength of its flavorful carnitas and other outstanding recipes, Las Delicias (16th & Pennsylvania; 303-839-5675; www.lasdelicias.net) has become a Denver institution expanding from its humble beginnings as a small two-table café to huge restaurants in Denver and its suburbs; those up-scale cupcakes that are all the rage are baked daily at Mermaid’s Bakery & Pie House (1543 Champa, 303-534-0956; www.mermaidsbakery.com) which entices you with flavors like Fireball, Strawberry Lemonade and Dark Knight. Chipotles of the world, stand down and make way for the original big burrito. Out of what can only be described as a bright yellow doublewide, El Taco de Mexico (714 Santa Fe Drive; 303-623-3926) serves ginormous burritos with Mexican rice, not that wimpy white stuff, flavorful onions and eyewatering salsa. Try the chile relleno burrito; El Noa Noa (722 Santa Fe Drive; 303-623-9968; www.elnoanoadenver.com) has an extensive menu and its patio is large and multi-tiered. Serving the Denver metro area for 25 years, Rosalinda’s Mexican Café (2005 W. 33rd Avenue; 303-455-0608; rosalindasmexicancafe.com) is known for giving away its award-winning food every Thanksgiving and Christmas when it hosts dinner for the hungry and homeless; because the owners are from Puebla, Chili Verde (4700 Tejon; 303-477-1377; www.chiliverde.net) brings the culinary traditions of southern Mexico to North Denver; taking time out of their prayers, the Capuchin Poor Clares support their cloistered order at Our Lady of Light Monastery by baking some downright heavenly Clarissa’s Cookies (3325 Pecos; 303-455-6338; www.midamcaps.org/cookies.html). You can order these morsels on line or pick up a few boxes in person – but not on Sunday. Like Larimer Street, West 32nd Avenue has two very distinct sections. The part of the avenue that is west of Federal Boulevard is one of the most “up and coming” (translation: high rents) neighborhoods and has upscale boutiques, cheese and wine shops, and great restaurants including Julia Blackbird’s New Mexican Café where the outstanding food is rivaled only by the vivid colors and décor of this secluded, homey café. East of Federal Boulevard, W. 32nd Avenue is much more latinocentric. It is the area in which Latinos were originally concentrated so behind some of the facades you’ll see the marquees and box office of the Holiday Theater where Spanish-language movies were shown. Gentrification is slowly taking place here so the area is an interesting mix of restaurants but be sure to take time to have the enchiladas and tortas at Taquería Patzcuaro (2616 W. 32nd Ave; 303-455-4389; www.patzcuaros.com); and if you’re there at 10:30 am Panaderia Rosales (2636 W. 32nd Ave; 303-458-8420; www.rosalesbakery.com) has conchas hot from the oven. Chubby’s Hamburger Drive In or the Original Chubby’s or as they say in California, the OC (1231 W. 38th Ave at Lipan; 303-455-9311). There seems to be a Chubby’s in every quadrant of the city but they are not franchises. In fact a hand-written note on a paper plate taped to the cash register disavows any ties to other Chubby’s even though the others are run by family members. Can you say family feud? This legendary hole-in-the-wall take-out sells more than just some of the hottest green chile cheese fries and burritos with chicharrones (which are their specialty despite the hamburger in their name). The dive is almost holy ground in the Northside and a great place to watch the diversity of the city play out as customers wait for their orders. If you’re craving a cortadito or a Cuban sandwich, you can’t miss at Buchi Café Cubano (2651 W. 38th Ave; 303-458-1538); one of the newest entries to the international flavors of Denver is Viejo Domingo Argentinean Grill (5555 W. 38th Ave; 303-433-5777) whose empanadas and grilled steaks are not to be missed; one of the first to introduce Denver to the small, soft, double corn tortilla taco was Tacos Jalisco (4309 W. 38th Ave; 303-458-1437; www.tacosjalisco.info). The varieties seem endless and if the accompanying jalapeño toreado isn’t hot enough there’s also a spectrum of salsas varying in heat and color. W. 44 Avenue and Lowell is a full-service area where you can get an exotic dinner at Café Brazil (4408 Lowell; 303-480-1877; www.cafebrazildenver.com); recharge yourself with horchata or Abuelita mexican hot chocolate with a double shot of espresso at Taza de Café (3565 W 44th Ave; 303-477-0097; tazadecafe.com); pick up some soft, moist and delicious cupcakes sans the designer prices at Heavenly Cakes (3559 W. 44th Ave; 303-433-0747; www.heavenlycakesco.com); one of the few, if not only, American Indian eatery in Denver is Tocabe (3565 W 44th Ave; 720-524-8282; www.tocabe.com) which means blue in the Osage language has warm fry bread that can be an Indian taco or dessert. Countless Mexican, El Salvadoran and Latino restaurants populate Federal but try healthy chicken marinated in red chile and grilled to perfection from Rico Pollo. Two of its five outlets bookend Federal. (W 52nd Ave & Federal and 2049 S. Federal); fiery New Mexico chile and larger-than-two-hands hamburgers stuffed with chile relleno await you at Jack n Grill (2524 Federal; 303-964-9549; www.jackngrill.com). To make room for the baseball stadium, this must-have restaurant for the downtown crowd moved to the opposite end of Larimer. The location may be different but the food remains just as great at Casa de Manuel (3158 Larimer; 303-295-1752) where the menu title “Regular Dinner” belies its excellence and there are no “smothered” burritos but only “wet” ones. art images: Accordionist by Carlos Frésquez; For Lalo by Stevon Lucero; Blue Mustang by Luis Jiménez; Western Union by Tony Ortega; Comida by Daniel Luna. pamphlet design and graphic work by Mercedes, Inc.
Posted by Manuel Ramos at 12:01 AM 3 comments. Click here to leave a comment. As Texas textbooks go to the right, so go . . .